The DVSA ‘Show Me, Tell Me’ questions test your knowledge on basic car maintenance and safety. The driving test examiner will ask you two questions at the start of your practical test, one show me and one tell me from a list of 19 questions. A. Identify the coolant tank and check the min/max markings. If the coolant is below the min mark more coolant should be added. To do this, unscrew the cap and pour in coolant until the max mark is reached. A. If the steering becomes heavy the steering may be faulty. Before starting a journey two simple checks can be made. 1) Gentle pressure on the steering wheel, maintained whilst the engine is started, should result in slight but noticeable movement as the system begins to operate. 2) Turning the steering wheel after just moving off will give an immediate indication that the power assisted steering is functioning correctly. A. Activate the brake pedal and make use of reflections in garage doors etc to see if the brake lights come on or ask someone to help. Q7. Show me how you would switch on the rear fog light(s) and explain when you would use it/them. (No need to exit vehicle). Q8. 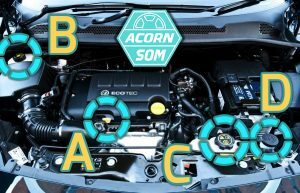 Identify where the windscreen washer reservoir is, and tell me how you would check the windscreen washer level. A. Identify reservoir and explain how to check level. Check your car’s manual to see how to do this. Q12. Show me how you would set the demister controls to clear all the windows effectively, this should include both front and rear screens. Q13. Show me how you would switch on the rear fog light(s) and explain when you would use it/them. (No need to exit vehicle). Q14. Show me how you switch your headlight from dipped to main beam and explain how you would know the main beam is on whilst inside the car. Q17. Tell me how you would check that the brakes are working before starting a journey. Q18. Show me how you would check the parking brake for excessive wear. Q19. Show me how you would check that the direction indicators are working correctly.